The Meteosat satellite system is an example of a very successful European endeavour. First designed in the early 1970s, the first model was launched in 1977, and the same design is expected to be in use until at least the end of 2003. The expected 26 years of operational service amply justifies the initial development effort. A few relatively minor design changes were introduced after Meteosat-3. The overall size of the satellite is 2.1 meters in diameter and 3.195 meters long. Its initial mass in orbit is 282 kg. Additional to this dry mass is the hydrazine propellant used for station-keeping, amounting to approximately a further 40 kg at the beginning of life. In orbit, the satellite spins at 100 rpm around its main axis, which is aligned nearly parallel to the Earth's north-south axis. Meteosat is composed of a main cylindrical body, on top of which a drum-shaped section (diameter 1.3 m) and two further cylinders are stacked concentrically. The main cylindrical body contains most of the satellite subsystems, including the radiometer. Its surface is made up of six panels covered with the solar cells which provide the electrical power. The panels also have cut-outs for sensors, thrusters and umbilical connectors. The cylindrical surface of the smaller drum-shaped section, mounted on top of the S/UHF platform, is covered with an array of radiating dipole antenna elements. Electronics within the drum activate the individual elements in sequence, in reverse order to the satellite spin sense. This subsystem constitutes an electronically-despun antenna whose function is to ensure that the main transmissions in S-band are always directed towards the Earth. The two cylinders mounted on top of the drum are toroidal pattern antennas for S-band and low UHF respectively. An apogee boost motor containing solid propellant is initially attached to the bottom of the satellite at launch. This is used to boost it from its post-launch highly elliptical orbit into the required circular equatorial orbit. Following this burn, the apogee boost motor is jettisoned, leaving an opening to give a clear field of view for the radiative cooler which cools the radiometer infrared detectors. Development and manufacture was by a consortium of European companies was led by the French firm Aerospatiale, with final assembly of the satellite at the latter's Cannes centre. 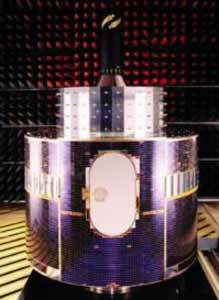 Meteosat-1, -2 and -3 were developed and operated by the European Space Agency (ESA). Meteosat-4, -5 and -6 were developed under the Meteosat Operational Programme which ran from 1983 to 1995, originally under the responsibility of ESA, then under the responsibility of EUMETSAT from 1986. Meteosat-7 was developed under the Meteosat Transition Programme of EUMETSAT.